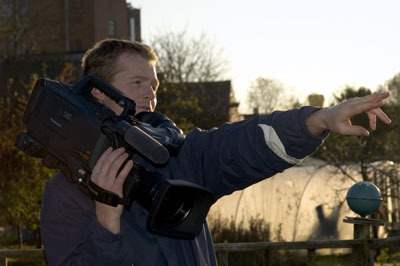 Born in Yorkshire, filmmaker Steve Watson gained a BA Hons in Contemporary Art at Nottingham Trent University. He majored in Performance and Visual Art. Currently, Steve directs mainly documentary films for broadcast including 'In Shane's Shoes' for Channel 4 about feature film director Shane Meadows. He has also directed numerous commercial and promotional films working mainly under his production company Big Time Films. Clients have included Channel 4, Warp Films, Optimum Releasing, fashion designer Paul Smith, tailors Whitcomb and Shaftebury (Saville Row, London), The University of Derby, New Deal for Communities, The Youth Hostels Association, NHS, Leicestershire Road Safety Campaign, 'The Gob Squad' and 'Meeting Ground' theatre companies, East Midlands Arts, Nottingham City and County Council and Derby City and County Council. Steve is a highly skilled operator and trainer of camera, sound, lighting and editing equipment and provides industry level media training at The University of Derby. He is an Apple Certified Trainer in Final Cut Pro (Editing), Apple Certified Pro in Motion (Motion Graphics) and is a BBC Trained Camera Operator. He is currently directing a documentary film for the BBC. Steve is also developing several film projects with Big Time Films.